For Whom Intended This course is intended for personnel involved in metrology, instrumentation and various testing activities. It is recommended for TTi’s Instrumentation Test Specialist (ITS) Diploma Program and is designed to provide a basic understanding of the methodology of calibration of electrical measuring and test equipment. Brief Course Description The course commences with a brief review of some basic terminology, systems of units, measurement standards, traceability and types of error. The course then covers calibration standards and documents affecting the calibration of electrical items. A brief review is made of measurement uncertainty. 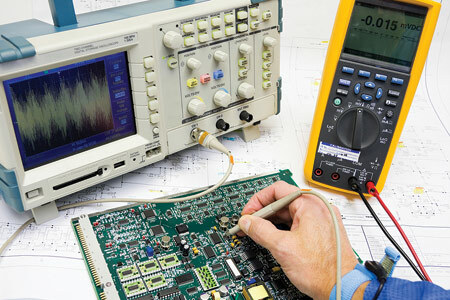 The course then covers calibration equipment and techniques in detail, starting with a discussion of electrical instrument calibration with precision instruments such as VOM devices, oscillators, counters, function generators, power supplies, RF power instrumentation, temperature simulation and measuring equipment, and fiber optic instruments. Electrical working standards are discussed, such as meter calibrators, oscilloscope calibrators, multi-function calibrators, distortion analyzers, counters, LF Spectrum Analyzers, RCL Meters and substitution boxes, and more. Attention will focus more on generic processes and theory of individual measurements than on how to calibrate a specific instrument. We will explore the background and theory of precision measurements in voltage, current, resistance, capacitance, inductance, frequency, and LF/RF power. Further discussion of measurement and theory in noise, total harmonic distortion, phase angle, modulation, and rise time will be pursued in detail. The instructor presents the course aided by overhead Power Point slides. Students are expected to participate in classroom discussion and exercises. Diploma Programs This course is recommended for TTi’s Instrumentation Test Specialist Diploma Program. It may be used as an optional course for any other TTi specialist diploma program. Prerequisites There are no definite prerequisites for this course, but TTi’s courses Electronics for Non-Electronic Engineers, Metrology Concepts and Instrumentation for Electrical Test and Measurement would be helpful. Supervisors are invited to telephone or e-mail TTi on prospective attendees’ backgrounds and needs.